Keeping a clean home on a busy schedule is always a work in progress. I’ve found ten areas that, when they go undone, zap my energy and bring on stress. When they are done, there is more order and peace in our home and life. 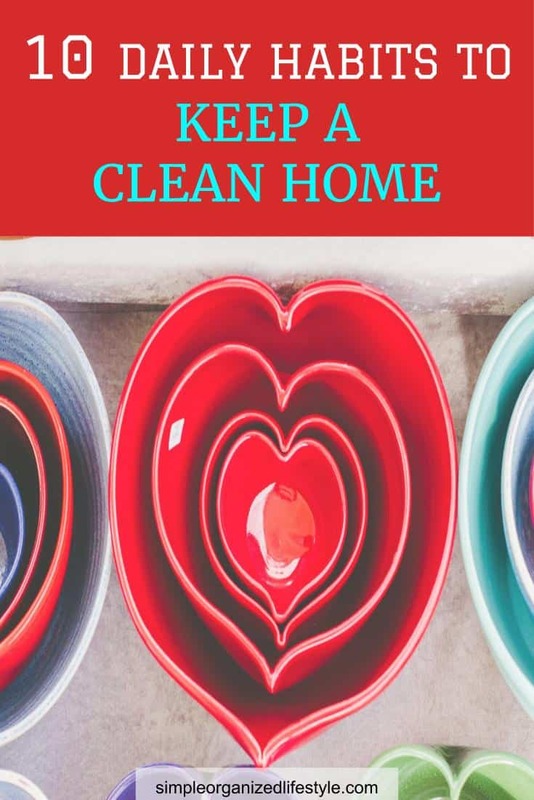 These are ten daily habits that can help keep a clean home. Doing them daily gives back energy and time for the people and things that matter the most. Once they become routine, you can move on to other areas of home organization and set new goals for the areas of your home that you want to improve. 1. Keep dishes in the dishwasher or put away. Looking at dirty dishes is an instant mood changer. It sends the “gotta do that- after I do this- if I get to it…sigh” message to yourself. Don’t send that message! Instead, put dishes in the dishwasher as you cook and right after you eat. Your sink will be empty and it’s a daily habit that will keep your home cleaner and your attitude better. 2. Sweep the most high traffic areas in your kitchen or where everyone enters the home. Keep a broom close to the area where you need it the most. For us, it’s the hallway off the garage where we come in and out all through the day. Our laundry room is also off this hallway so I keep a broom and trash can there so that I can easily get to it and sweep the high traffic hallway area every day. This is my husband’s daily habit that I have come to greatly appreciate. It keeps a room looking tidy and it just feels better to get under the sheets at night instead of searching for them from the night before! It’s like an internal way of checking off the first “to do” of the day and feeling that sense of embracing the day ahead. 4. Keep clothes on/in one of the 3 H’s- Hanger, Hamper or Hidden (drawer). Clothes quickly become clutter… in the floor, on the treadmill and on the tub (speaking from a lot of experience here)! One thing to help is to designate the same drawer or place in your closet for different clothing items. This speeds up the process of putting things where they go as soon as they are clean, or on the hanger if you can get another day’s use from them. 5. Declutter for a few minutes each day. When decluttering for a few minutes each day becomes a habit, the results will let you breathe easier. It’s amazing the amount of things we accumulate that just take up space and become one more thing to clean. I keep a trash bag inside my closet for things to donate once it’s full. I never miss any of it once it’s gone! 6. As you use things, put them back in their home. Develop the habit of putting things back in their home after you use them. If this is an area to improve, start with “that thing” you are always looking for… keys, paper work, shoes, etc. It will save your time from looking for things and keep your home cleaner. This only needs to take a couple of minutes. I wipe counters down quickly while I’m waiting on coffee or fixing a meal. A wiped down counter gives everything a fresh, clean feeling. A simple, natural solution that works for most countertops is vinegar and water. 8. Do 1-2 evening preps for the next day. Pick 1-2 things that drive you craziest in the morning when it’s time to get out the door and do those things the night before. Maybe it’s picking out your clothes or putting the kids’ backpacks by the door. 9. Pick one task each day to work on for 5 minutes- don’t get caught by perfection paralysis. Focus for small amounts of time on different areas and you will see gradual, but consistent, improvement over time! 10. Give the bathrooms a quick wipe down and replace the toilet paper. Keep extra toilet paper rolls under the cabinet or in a holder and give the fixtures a wipe down so that keeping the bathrooms clean is easier to manage from day to day. These habits should be built into your day at times when they make sense, like making the bed in the morning and putting the dishes away after dinner. This way you can build them into the day and not view it as a daily cleaning time or one more thing to add to an already busy schedule. Involve the family and kids where it makes sense since everyone in the home should take ownership in keeping it clean. Don’t let any of these habits pull you in a different direction, such as deciding it’s time to organize every cabinet and drawer. That will prevent you from getting anywhere on the mission to keep a clean home. 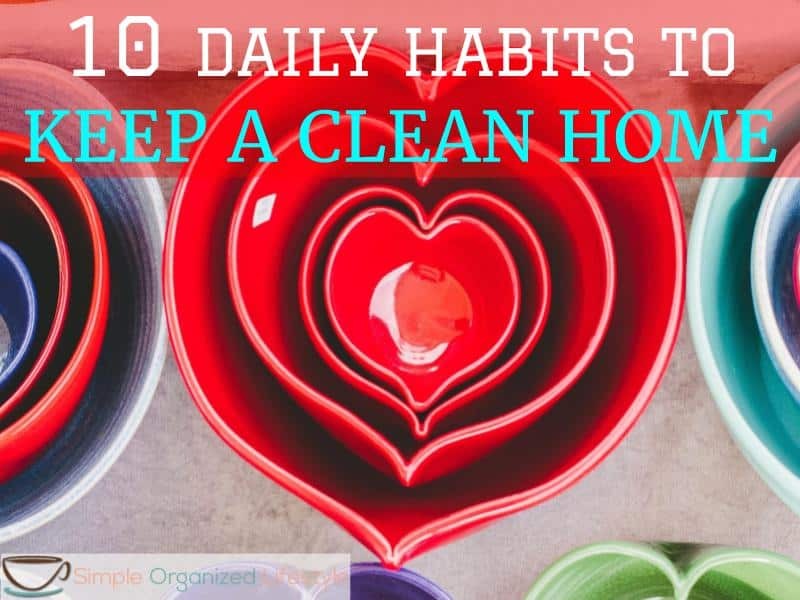 These 10 daily habits will improve how your home looks and functions, which will make you feel better and give you more time for the people and things that matter the most! What’s you favorite habit for keeping a clean home? Join SimpOL’s monthly newsletter & get exclusive access to all printables here! All super practical tips Misty! You are right that doing a little bit each day is so helpful. And yes to making the bed everyday! That makes a big difference, keeps it manageable at least. Thanks Miranda!